The Century II Performing Arts & Convention Center is a multi-functional facility, fully accessible to all users. 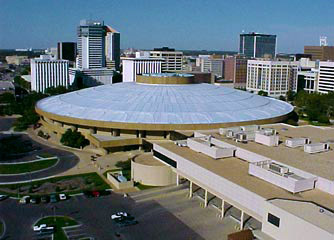 Wichita's convention facilities can be tailored to meet your specific needs, making Wichita your destination of choice. For meeting planners and convention attendees, Wichita offers convenient accessibility by air or interstate highways. First-class hotels and the thriving Old Town Entertainment District are within walking distance of the 721,000-square-foot Century II Performing Arts & Convention Center, located in the heart of downtown on the bank of the Arkansas River. Century II has five separate performance and convention spaces available, three of which can be combined into nearly 200,000 square feet of display space. From theater, opera and ballet performances, to concerts and lectures, conventions, tradeshows, and banquets... Century II can meet your needs.